The grand churches of the New Orleans region — some of which could rival the cathedrals of Europe — are part of what makes the area unique. And if you have admired stained glass art in any of these houses of worship, chances are you have seen the work of Attenhofer’s Stained Glass Studio. 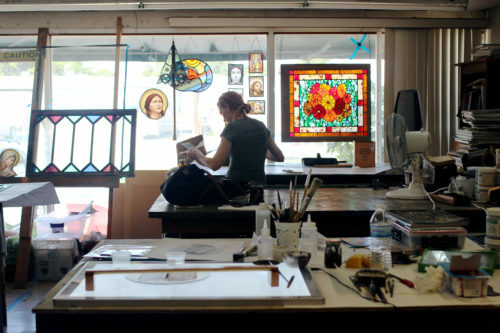 Attenhofer’s Stained Glass Studio, located in Metairie, comprised of owner Cynthia Courage and a small staff of dedicated artisans, has faithfully brought back to life windows at churches such as St. Louis Cathedral, Saint Maurice Catholic Church, Historic Saint James AME Church, First Unitarian Universalist Church of New Orleans, and Pro Multis Chapel in Lacombe, Louisiana, to name but a few. 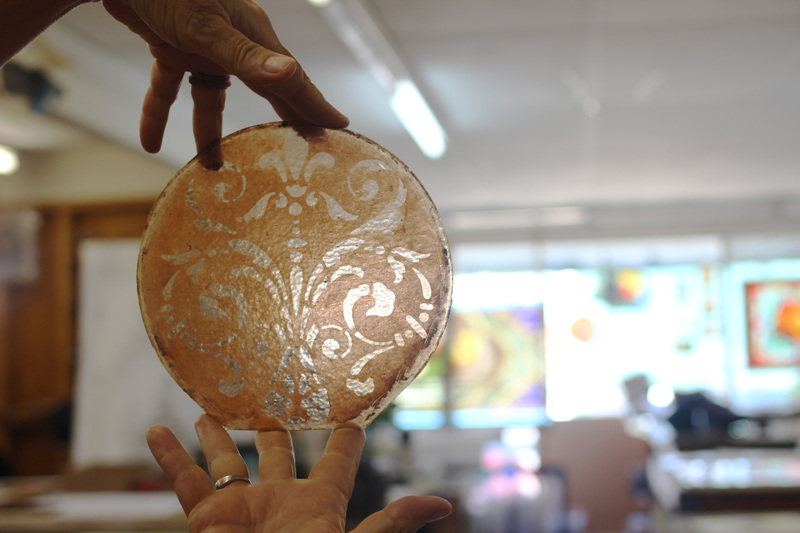 They don’t only restore, however: the studio also creates new stained glass windows. Attenhofer’s has been fabricating and preserving stained glass windows for well over 40 years, a one-stop shop for custom design and installation needs. Unfortunately, it seems that these acts of vandalism are on the rise. “In last year, I have repaired vandalized windows at St. John the Baptist, where someone threw bricks through the painted glass; St. Louis Cathedral; First Unitarian Universalist Church, and the Salvation Army,” she said. However, Courage and the talented artists at Attenhoffer’s are up to any challenge. 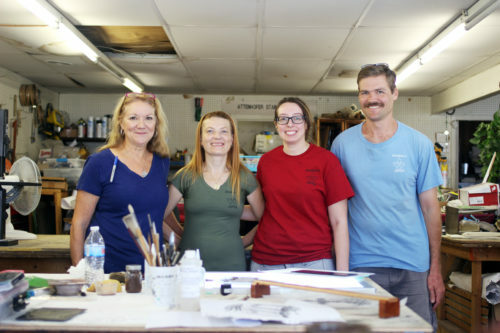 The full-service art glass studio, whose mantra is, “Let us change the way you see the Light!”, is widely considered to be a preeminent source for recapturing old New Orleans charm. 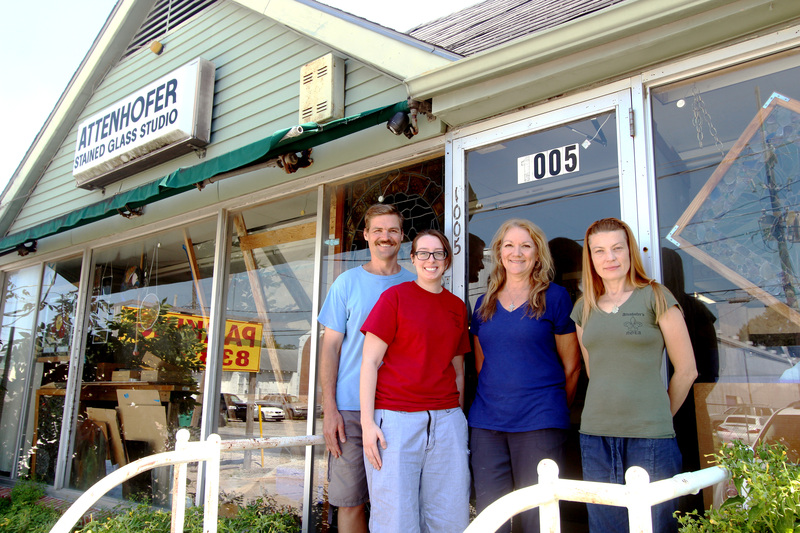 Stained glass artisans Brian Kneziak, Elise Thomas, owner Cynthia Courage, and Anastasia McGee pose in front of the studio. When first visiting Attenhofer’s, Courage was convinced by Ken to take a class in stained glasswork. Despite her initial reluctance, as a mother with young kids and little free time, she immediately took to the craft. “I managed to complete most of my projects within the first two weeks or so, and that’s when Ken approached me and asked me to work for him,” Courage said. Her college bachelor’s degree was in business and marketing, but the art of stained glass called to her. “I was already employed, but he was persistent. I had a solid art background, and my passion truly was in art/design. Just like that, Courage was forever hooked. Over the next 15 years, she worked closely with Attenhofer. “I worked on dozens and dozens of historical churches at all kinds of elevations while working with Ken,” she said. 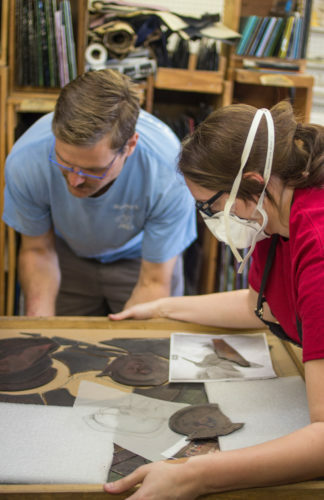 “I took advantage of every opportunity I had to learn more about historical glass and conservation of glass, and looked forward to the next challenge. After taking over as owner of Attenhoffer’s, Courage swiftly worked to acquire her contractor’s license, with a specialty in Artwork and Stained Glass Installation, Restoration and Renovation. Additionally, she gained professional memberships with the American Glass Guild (and served on their Board of Directors from 2016-2017), the Stained Glass Association of America and the American Institute of Conservation. 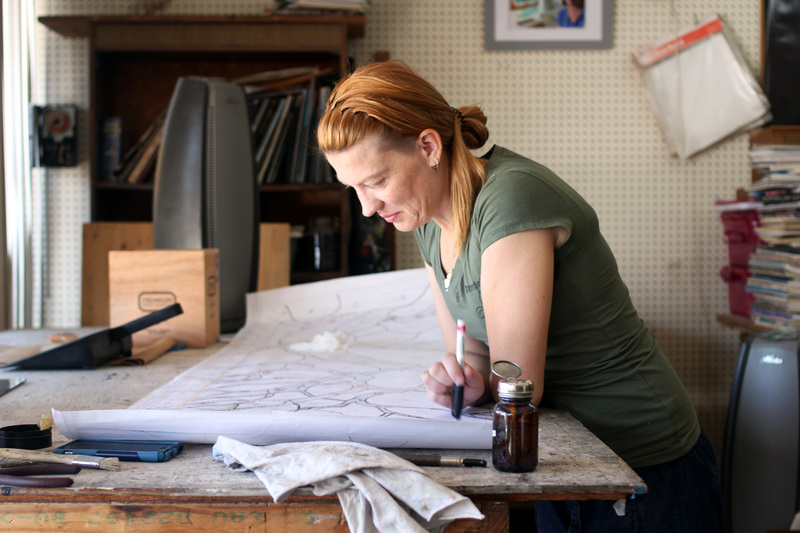 Her experience and continued desire to hone her craft has made Attenhofer’s the go-to place for people in need of stained glass restoration. Her coveted repertoire includes numerous styles of stained glasswork from German, French, Flemish, Old English, Spanish and American provenance. 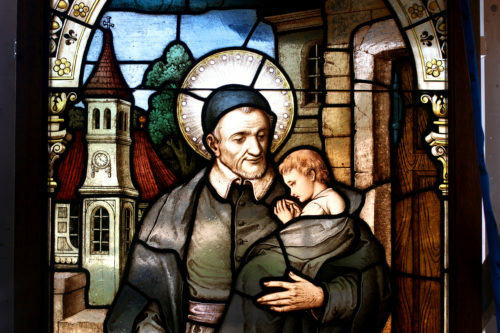 This stunning window featuring St. Vincent Depaul was badly damaged in a fire. Courage and her staff worked tirelessly to bring it back to its original grandeur. Courage’s years working with Attenhoffer to master her stained glass ability, and later as owner, solidifying how to run an in-demand business, were, in a sense, coursework leading to her ultimate test. Reviving the churches devastated by Hurricane Katrina was more than a test of talent — it was a test of will. The shattered glass that littered the sidewalks (along with other debris) in the harrowing days that followed Aug. 29, 2005, helped paint a picture of the region so devastating that it could cast a shadow over any eternal optimist. In these glass-half-empty days, it was up to people like Cynthia Courage to pick up the pieces — literally. One of the first churches that Courage and her Attenhofer team were able to work on was Saint Teresa of Avila, the landmark Catholic church in the Lower Garden District between Camp and Prytania streets. They also repaired, in those early days post-storm, numerous panels of paintwork at Notre Dame Seminary that were about 30 feet in the air. The process of collecting shards of barely salvageable stained glass, and the broken frames that once held their art firm in place, proved to be more painstakingly difficult than any other previous endeavor. 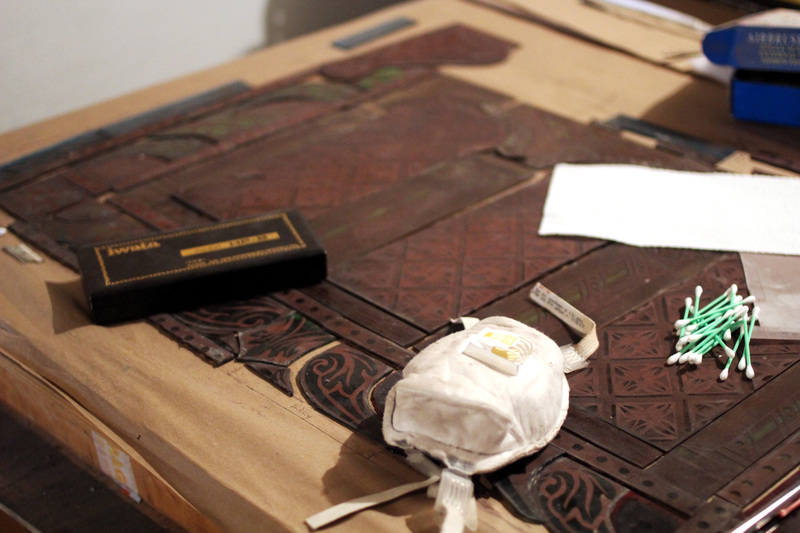 The immense work that the artists at Attenhofer’s faced was akin to dealing with an endless jigsaw puzzle. And, at the same time, many of the artists found themselves homeless as a result of the storm, living in FEMA trailers. But, as long as they continued to work they had a purpose — reviving art that would have otherwise been totally lost and forgotten. Unlike most artists, much of the staff’s work at Attenhofer’s is not about individual creation, but about trying to connect spiritually with a former artist in an attempt to recapture their magic. The key to stained glass restoration is to realize that you are becoming part of its life, as your hands were not the first to touch its glaze, and most likely won’t be the last, Courage said. The art lies within trying to shape frames to the specification of the original, and matching shards of glass from years gone by to a color of today. “The goal is to keep as much of the original as you can,” Courage said. “You have to honor the work of those before you, the forgotten craftspeople,” she said in previous interview. “I’m very respectful. I feel I’ve been put here as a caretaker.” Courage’s team was commissioned to work outside New Orleans, as well, in towns along the Gulf Coast during Katrina recovery efforts. One of these new churches for which Attenhofer’s created new stained glass windows is Covington’s Most Holy Trinity Catholic Church. Many of its parishioners actually relocated to the area following the flooding of St. Bernard Parish. 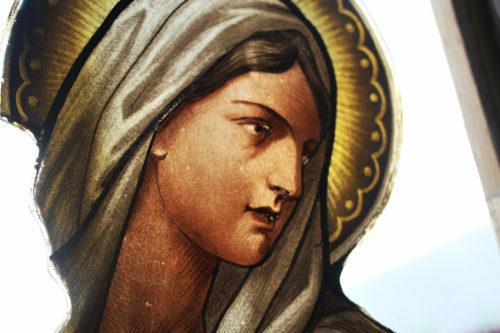 “We worked on this project for a three-year span, and then we witnessed the birth of Most Holy Trinity. It was a splendid day when they dedicated that church. It was overwhelming to see all of those families finally have their new home,” she said. The only full piece of glass that Attenhofer’s employees were able to salvage from the back of St. Louis Cathedral after it was recently vandalized. 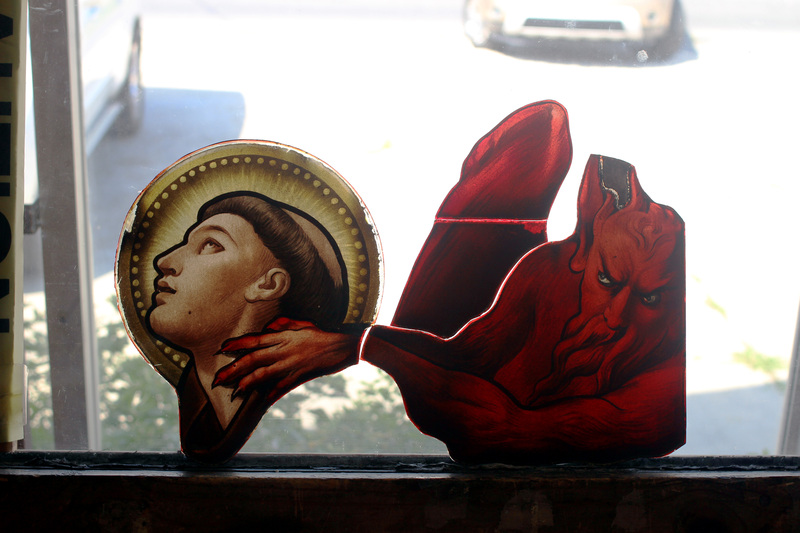 Cynthia Courage and the artisans at Attenhofer’s have not wavered from their station as the caretakers of the stained glass windows found adorning the churches of the New Orleans region. These glass restorers, whom often are working on depictions of scenes from the Bible or religious symbolism, know their work holds more than just beauty. 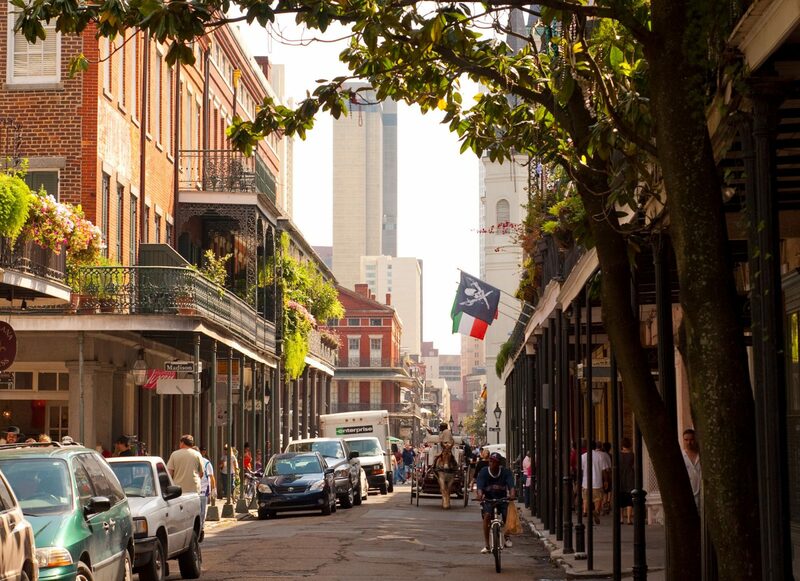 Their art brings wisdom and hope as the New Orleans’ sun beams through their emblematic panels. But these visions first brought to the city centuries ago are not limited to cathedrals. Countless Victorian-style mansions in the Garden District and other neighborhoods have original stained glass art. Moreover, the neighborhood of Mid-City bears a considerable amount of stained glass windows — though these tend to feature modern twists on the art. Interested in learning more about stained glass in New Orleans? Join the PRC on Saturday, November 4 when our Stained Glass Art in Sacred Places tour heads to St. Tammany Parish to tour four stunning examples of Catholic architecture and decorative glass. Find out more information and buy tickets here.